Dr. Mona Ubhi graduated from the University of Waterloo School of Optometry before completing a residency in binocular vision at Nova Southeastern University in Florida. She recently became a Fellow of the American Academy of Optometry and is working towards her College of Optometrists in Vision Development Fellowship. Dr. Ubhi reflects on her professional path and sheds light on how concussions can affect the visual system. Q: What is the difference between a regular ‘family’ optometrist and an optometrist with a special interest in neuro-optometric rehabilitation like you? Can you tell us more about your optometric specialty? MU: So I’m an Optometrist with a specialty with working with concussion patients. It’s not the whole end of what I do, but that’s my primary focus. I really work with binocular vision issues, which is a lot of what concussion patients tend to have. I teach the patients to use their visual system more cohesively because sometimes after a head injury, any part of the visual system can be impacted. The visual system is really diverse; more than 50% of the brain is involved in vision. The eyes have to learn to team together, focus together, and to track together. If one of those areas is having an issue, then the visual system is not working at its primary best. Q: So you mostly see concussion patients. How did your interest for concussion start? MU: It started with a residency in binocular vision while I was at Nova Southeastern University in Fort Lauderdale. I wanted to learn more about binocular vision and vision therapy. In my residency, I worked with patients with strabismus, autism and special needs. I also worked with regular binocular vision issues and that’s where I also got introduced to traumatic brain injuries. Concussion, strokes… any other [neurological] issues that can happen, like encephalitis. [Concussion] was something that I really loved working with and I was interested in learning more about because it was an area that was so novel to me. And then coming back here to Ontario, I landed in a clinic that primarily works with concussions, and that’s really where everything took off. Q: Since you started working in concussions, what has been your most interesting case? MU: I feel I’ve learned so much from every patient. Each case that comes in, I learn something. The most interesting I think is a young woman in her early twenties. She had a very severe car accident, a head-on collision. And so when she came to first see me there was a history of a right lateral rectus palsy. That means that her right eye didn’t turn all the way out. When I saw her it was a partial palsy. It was surprising because with such a severe accident her symptoms didn’t match with what I would have thought; her symptoms were a lot less severe in nature. We’ve been doing some vision therapy procedures to help improve the symptoms she does have and improve the range of motion of her eye a little bit further. And so the last time I saw her, her right eye is now turning all the way out, it has its full function already which is pretty awesome. Because I learned all the concussion aspects from a visual perspective, I’m still learning about some of the other multidisciplinary areas like physiotherapy or biofeedback, and how these tools can help the visual system improve without the use of vision therapy. We still usually need vision therapy near the end for a full visual improvement, but some of the improvements you can see with physiotherapy and biofeedback alone are remarkable. Q: It goes to show how all the different systems are interrelated and that multidisciplinary care is essential in concussion care and recovery. MU: Yes. Sometimes you just become so engrossed in your area of specialty that you forget the patient is a whole person. And that there are all these other areas that are impacted or can impact vision. There has been at least 2 or 3 where I’ve seen how impacted the visual system was but by the time patients are done with physio or spatial awareness [training] or biofeedback and they end up in my chair, the visual system is almost near normal or near perfect. Q: What about your most challenging concussion case so far? MU: I think the most challenging is when mood is really impacted as well. I find that the mindset of the patient can really impact the recovery. So with a patient who is already very negative it really impacts how they are acting in therapy as well. For example if I’m doing a visual therapy procedure sometimes they will be nauseous with something that really does not make sense with what their visual system can handle. If I do an assessment and I see that the visual system should be able to do this yet I bring them in the therapeutic room and they’re not able to… sometimes that can be pretty challenging, especially when its a very simple procedure. Q: Mood is often affected after a concussion and it can preclude recovery as mood issues are not only due to the pathophysiology of a concussion but also to lifestyle changes, functional abilities and symptoms (like poor sleep, headache, dizziness…) post concussion. Have you seen a rare presentation that was challenging? MU: There’s this super cool case, a 25 year old man with a preexisting convergence insufficiency, which is not rare. Yet when I’m working with him the most challenging part was when he was like ‘Do you want me to look through my right eye or my left eye?’! He does not have a strabismus so I was thinking ‘What does he mean? Use both of course!’ With him it’s more about teaching him to use both eyes together, to have very good stereopsis (depth perception). This ability to pick one eye to see is really rare. Maybe he had a preexisting strabismus that self corrected and he never really learned how to use both eyes together and he can choose. Or was he always aligned, never had a strabismus, and maybe instead never learned or had sensory fusion. When you look at vision there is motor fusion and sensory fusion. With motor fusion that’s really bringing the eyes in alignment but sensory fusion occurs in the brain. So it’s really taking the two images from each eye and merging the two. This should have been an easy case but it turned out to be a challenging one. I feel the best spot to learn is with your patients. You’re seeing different things, they’re always bringing something new to the table. Q: So to conclude, what advice would you give to another optometrist caring for a concussion patient? MU: My best advice would be to listen to your patients and their symptoms. Remember that patients are more than a set of eyeballs, and it’s important to consider the whole patient. For example, some visual symptoms can be complicated by vestibular dysfunction or tightness in the neck. Multidisciplinary care is key for rehabilitation for many of these patients, and it’s important to build relationships with other practitioners you trust. She loves to travel! 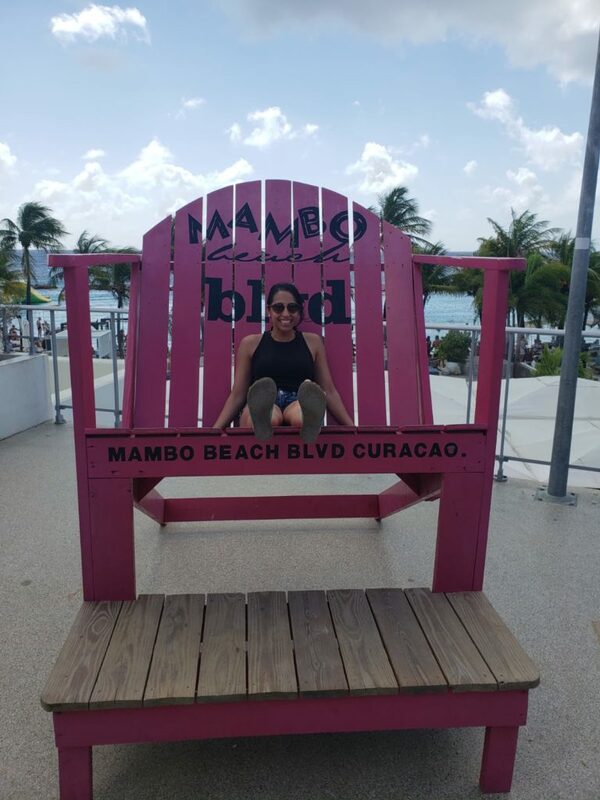 So far she has visited Canada, the US, India, France, England, Costa Rica, Nicaragua, Mexico, Saint Martin, Saint Kits, Saint Lucia, Antigua, Barbados, Bonaire, Curacao and Aruba. Her ideal vacation would be to visit a totally different country and to immerse herself in the culture. She dreams of a backpacking trip in Europe or Singapore. She loves to weight lift. Her personal best so far is a 200 lbs deadlift! Impressive for a featherweight! She once drove a race car on a race track! Isn’t our optometrist doc the coolest or not?